So yesterday I was having the urge to suddenly knit something. I haven’t knit for a few days since I was crazily busy getting this blog up and running, but now I thought it’s a good time to get back to knitting again. I always research what I wanted to knit and usually it takes forever (searching for patterns online and comparing them from one another, searching for actual images for colour inspiration, yarn selection process, all takes ages to do!). So after deciding I want to knit a Panda hat, I just found out that I don’t have suitable black yarn at home. Since it was just after midnight, I had no choice but to choose something else to knit. That’s where this extra tiny chickens came in. 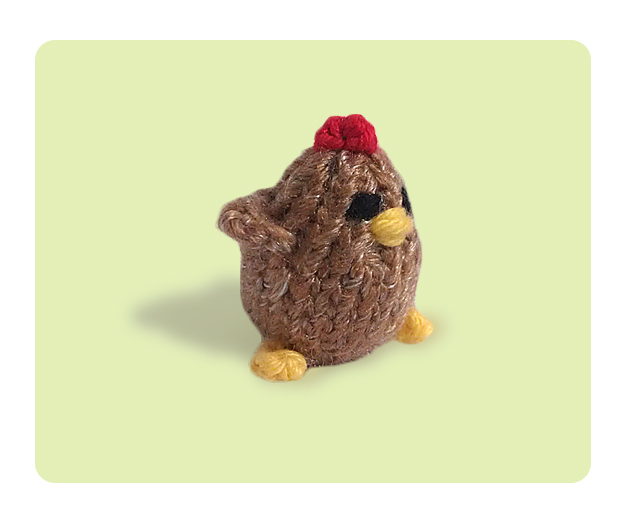 This tiny chickens pattern is designed by Anna Hrachovec, and you can find it HERE. This tiny chickens were quite challenging to make, aside from knowing how to use DPN I also needed to learn some new skills. The first is Kfb (Knitting in the front and back). Kfb, just like M1 is another technique of adding an extra stitch to your needle. The way is slightly different and I personally find it a little easier as you don’t need to second guess where the in between stitches are like in M1. Last but not least is learning how to knit an I-Cord. This was my favourite tutorials, she explains I-Cord and make it sounds so simple. Also in this video she teaches you how to do CO (Cast on) using your hand instead of needles. This technique is a big time saver as you can cast on much faster with hand therefore it’s much easier to count your stitches as you cast. To knit I-Cord, the main point is that you should never turn around your needles and instead slide off your work to the other side, then you knit again. While I was knitting my tiny chicken, I notice that the wings were a little short. If I knit another one I would knit extra rows to make them slightly longer. The hardest part I found were actually inserting the legs inside the body. I love to stuffed my toys really tight (which explains why my chicken looks plump ;)), and it was really difficult to pull through the i-cord along the fiberfill. But finally after I push and push.. it went in successfully. One side of the i-cord looks really strained after the force-pulling (Ooops), but luckily I found the legs looks too long anyway so I just undo some of the stitches to make them look cute and even. 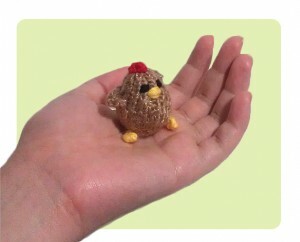 Now that it’s all done, my tiny chicken somewhat looks a little lonely by itself. Maybe if you can knit one too, be sure to post / tag it to the Facebook page and share it with us! (DPN) double pointed needles, chicken stuffed toys, cute amigurumi toys, face embroidery, free knitting patterns, intermediate knitting patterns, kid toys, knitted toys, tiny stuffed toys. Bookmark.